North Carolina Beaver working on tree for home and health. As the season begins to change so will the livelihood of our wildlife neighbors. One of our county residents is the beaver which will become more active with cutting down trees in the fall because they are preparing for the winter. Several landowners in the past several years have reported beaver activity on their properties, including tree girdling, dam construction and flooded roads. Beavers do not hibernate, so they plan ahead and build a stockpile (cache) of edible sticks in order to survive the cold winter. They stick one end of these sticks in the mud at the bottom of their pond near their lodge so that when the pond freezes over and they can no longer access new trees, they can swim out of their lodge, grab a stick, and bring it back to the comfort of their lodge to eat. Not much different than us in colder weather, but instead we go to the kitchen and return to our den with munchies to nibble on through the winter. Beavers provide many positive benefits to people and other wildlife; their ponds help control erosion and sedimentation, recharge groundwater resources and provides valuable habitat for waterfowl, herons and other wetland wildlife. Since both Jackson and Swain have much water and running water, it is a perfect habitat for them to flourish. When beavers hear running water from a stream, culvert or breached natural dam, then they will go to work trying to stop the running water to build their own landscape. But the beaver’s dams can also cause flooding in agricultural fields, flood roads, and residential areas. They can also destroy timber by chewing on or felling trees. If this is an issue on your property, then the Beaver Management Assistance Program (BMAP) may be of service to you. Jackson County is a participating county in the NC BMAP Program and is a service for county residents for nuisance beavers. BMAP is in partnership between the USDA Wildlife Services and the county, which is a cost-share program where the county government pays $4,000 annually to help landowners with major beaver problems. 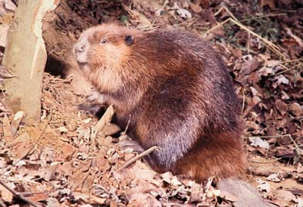 The Wildlife Service Officer will come to assess the situation on your property and determine the best means to mitigate and correct the beaver issue. Swain County is not participating in BMAP, but still can receive help through NCDOT with BMAP if a DOT road is being affected by beaver issues such as flooding or other beaver damage. Participants in the program pay a small cost-share fee for services. This cost-share fee is $25 for each visit to their property. There are no charges for first initial visit that will take about 15-20 minutes to explain the program. There is also a $125 charge for dam removal. After 15 visits to a landholder’s property in any one year, costs increase. There is no charge for the initial assessment, which includes time, spent discussing the program and signing paperwork. During this assessment, the wildlife specialist discusses with the landholder the positive and negative impacts of beaver and recommends the best course of action. If damage management activities are recommended, time and costs are estimated and the wildlife specialist begins work. Landholders wishing to conduct their own work are provided individualized training at no cost. For more information and assistance on Beaver Management or other wildlife problems please contact County Extension Director Robert J. Hawk at 586-4009 in Jackson County or 488-3848 in Swain County or email robert_hawk@ncsu.edu. • Boo! Don't Let Halloween Weight Sneak Up on You!